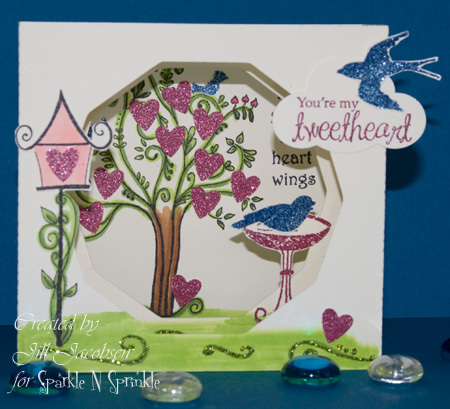 Welcome to the Sparkle N Sprinkle Deco Divas – Love is in the Air Blog Hop! If you hopped here by way of April, then you are in the right place. If not you might want to hop over to the beginning at Sparkle N Sprinkle to become eligible for one of the four great prizes. I chose to do Valentine cards for the hop and I just got done making a Cut File for this Diorama card and had to use it. It was a lot of fun putting all the layers together. You can find all the details here. What a great way to display your cards for months to come!! I was going to stop at one card, but this idea for the pink Leo had been in my creative mind for a while so I had to try it too:) But only this time I used the Spellbinders Hearts to cut out the center shapes instead of the octagon. 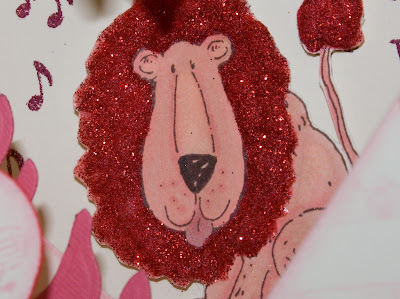 I love adding the Dimensional Glue to Leo's mane and covering it with Flocking and this time was no exception...I covered it with Cherry Sparkle, Sparkle N Soft! 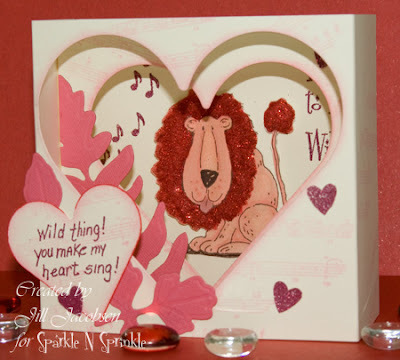 You can find out all the details herehttp://sparklensprinkle.com/g/view_photo.php?set_albumName=Valentines_Day&id=ahu. Thanks for stopping by and leaving me a comment.....I love reading them all:) Now hop on over to Brenda's blog to finish up the hop! 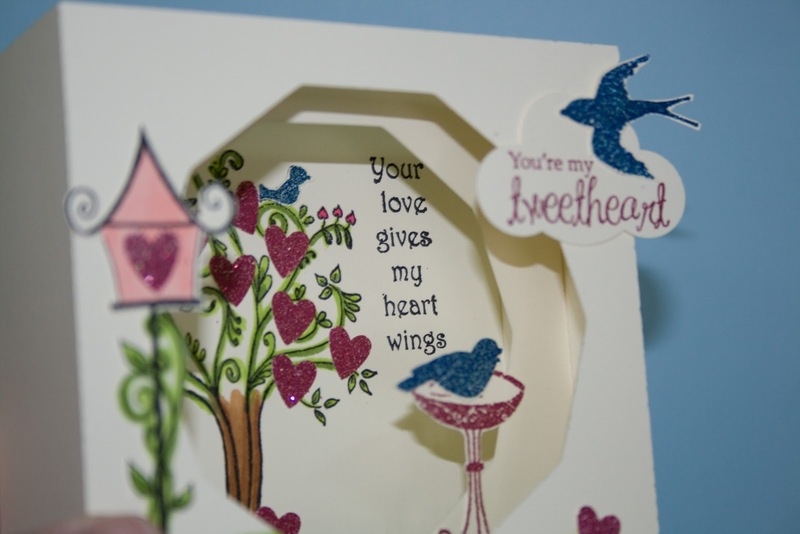 Your diorama cards are really great for your valentines. Both of the sets you used are perfect for the love theme. I love the diorama cards. Excellent idea!!! And Leo looks great with the sparkling red mane! These are too cool! We can tell who is the overachiever in the group, can't we! Aww these are so sweet and absolutely deserve to be out all year round! I'm off to see how you make them. Great cards Jill and we both used Leo, great minds think alike! But yours is definitely more "Valentines" day with the red mane! How unique. I've never heard of a diorama card before. Well done! These are both great diorama cards. I particularly like Leo hiding in his heart cave - listening to music! Too cute! These cards are fabulous! I love them. The scene on the first one is so cute. That lion's mane is great! These are both so cute Jill! The first one is so colorful and sparkly - really great scene! And Leo is so fun in pink!! Diorama style make them extra fun too! Oh my...how absolutely creative! I have to try this!! LOVE the pink Leo! How cute is that!!! The Cherry Sparkle adds just the right amount of bling.... Both dioramas are awesome! Jill, your diorama cards are so "tweet". Love the cut files you created, and your pinky Leo! Beautiful! Okay I never see anyone do tunnel cards anymore. These are so much fun. Yu make me want to do some. I love it! The lions mane :) love him. Wow what a Cool Idea never thought about doing it that way but very special. love the colors and the Glitter adds so much pop. thanks for sharing your cards. great job. I love the idea of a diorama card. I have never made one (yet), but look forward to one day. I always thought they looked very creative and different. My mother has made a few of them and they are always beautiful. I love the coloring on Leo. It's perfect! Wow! I learned something new with your beautiful card creations. I really like the diorama technique and the end results are fantastic. Thanks for the great ideas! Great diorama cards. Leo is fun in red and the heart tree is great with the sparkly blue birds. So adorable images and create use. Thank you for sharing it! Your cards are the best !!!!! WOW! How amazing! Love the images you used and the fancy cuts and folds. I love the lion, too cute! What wonderfully adorably clever cards. 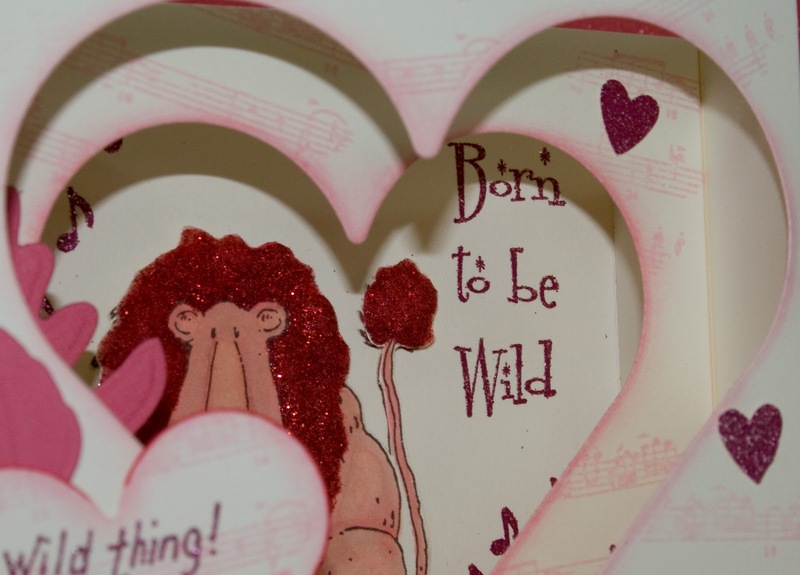 But I have to admitt... "Wild Thing" stole my heart. Thank you for sharing. What wonderful ideas and cute cards my mind is trying to hold all your great ideas cheers Lee G.
Your diorama cards are so great!! Love the 3D look. Glad you made the 2nd card - Leo looks great in pink!! Love the dioramas! Will have to try one! 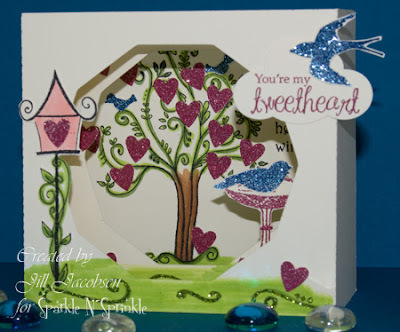 My favorite is the heart tree with the birds - will have to check that set out! Thanks so much for the inspiration! Jill I love your diorama cards. Leo is great with the cherry sparkle mane. Love the diorama cards, hope to take the class at the store in Ruskin soon. The glitter on Leo's mane is great. Both are awesome and I love the lion with all the fluff. Such a great idea, adding some wild to the love. The layers are fun, I like the "tweetheart" and I like the grren and blue on the first card and the glitter on the second. OMG, your diorama cards are awesome. I love the details of the first card and I love Leo in the second one. Your first card is especially lovely. The heart tree & birds with all the wonderful glitter is great. Leo did look good with pink. The sparklensoft on his mane was just the right shade. I loved both of your cards. The 3-D technique was just fabulous and the innards were wonderful. I loved Leo's red mane and the heart tree. Wonderful! 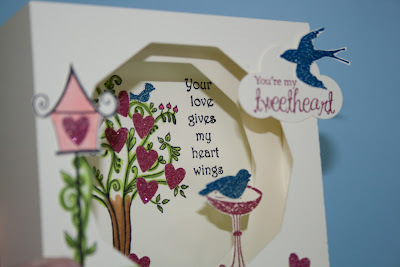 Love your 3-D cards, they're gorgeous!! Lion card is just too cute. Thanks for sharing your ideas with us.